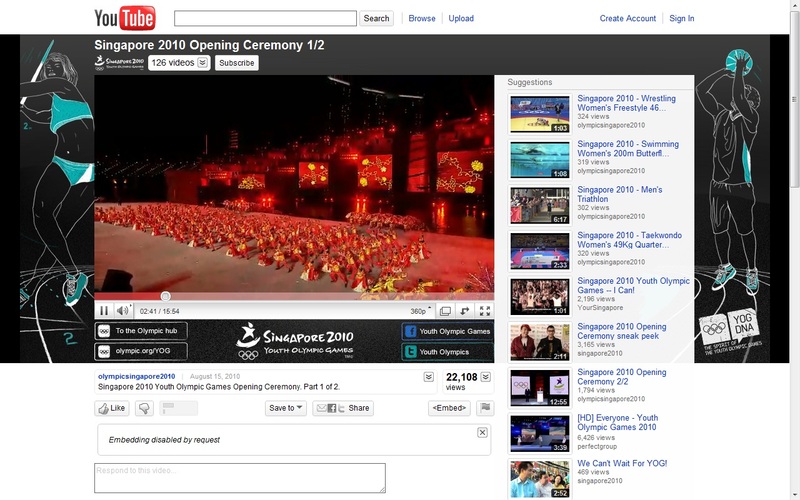 Singapore 2010 Youth Olympic Games Opening Ceremony. Watch opening ceremony video on YouTube. Singapore 2010 Youth Olympic Games Opening Ceremony video was uploaded yesterday. I'm sorry, i can not embed the video here. Because this video contains content from International Olympic Committee, who has blocked it from display on this website. Embedding disabled by request. Just using iframe. Click here for watching this video on YouTube. Click here for watching this video on YouTube.